After the universal hit “I” , Vikram came back with his fabulous screen presence to entertain you via Vijay Milton’s “10 Endrathukulla”. But the movie is not as like expected, there is so many action sequences to bring life and thrills into the film but sadly the execution and screenplay is a big letdown that has more amount of boredom than entertainment. Loosely inspired and modelled from Jason Statham's Transporter movie Vikram's no name character in the film is one who transports anything without caring for what the purpose and content of his assignment is. He meets Shakeela (Samantha) and from there they are moving to Mussori, a scenic place in Northern part of India. What is the mystery behind this journey from Chennai is what 10 Endrathukulla is all about. The only plus point in an otherwise lacklustre screenplay and boring movie is the onscreen chemistry between the lead pair. Vikram with his screen presence try to add and infuse life and energy but all for a losing cause as 10 Endrathukulla is a movie that makes a tiring watch almost till the final stages. The only major excitement happens in the final forty minutes or so. In other words, we have a badly presented first half and a somewhat entertaining second half. By the time something do happen, it was too late. There is plenty of action and car chases in the first half but that alone cannot save a film if the screenplay could not bring in some energy. By half way mark, as said the film was heavily gasping for some much needed breath which sadly director Vijay Milton could not pump in. Vikram tries his best be it action, light humour in the way he approach things in a larger than life character. But in spite of his positive energy, he was not able to save this wafer thin story from sinking. Samantha was good in parts. Her onscreen chemistry with Vikram did work out well but some unexpected twist in her character towards the final stages was a clear case of overacting. Pasupathy acted his part well. Rahul Dev repeated his usual antagonist character while Abhimanyu Singh becomes just an ordinary baddie with nothing to do. What stands out throughout the movie is its top notch camera work by Bhaskaran KM. 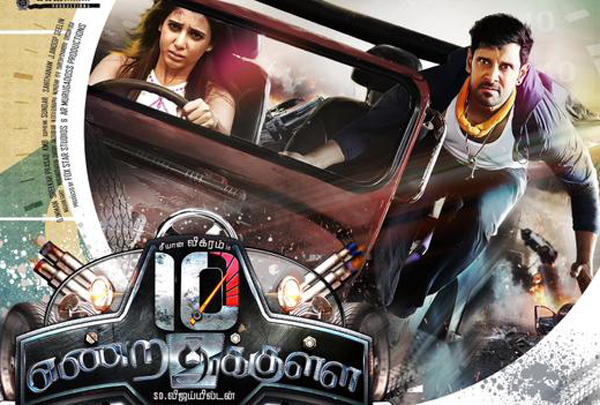 The visuals look sleek and are one of the biggest strengths of 10 Endrathukulla. Another positive comes in the form of stunt sequences, for almost all such scenes (especially those involving cars) have come out really well. While the second half is a touch racy, its predecessor moves way too slowly for a movie which was expected to be on the fast lane throughout and that comes across as a disappointment. Bad placement of songs and the story itself are some of the negatives of this movie. Background score by Anoop Seelin was dull and songs by D Imman could not create any magic. Action and chase sequences were choreographed quite well but the climax sequences could have been better. Overall, 10 Endrathukulla turns out to be a below average movie with a bad execution from Vijay Milton who couldn't repeat the feat of Goli Soda. This is the one among the many usual commercial entertainers that largely aims at Vikram fans. Vikram and Samantha having a huge fan followers, Camera works in the movie and Vikram movie After “I”. Other than these all factors nothing will help the movie in box office. Again it's proved that, the recent trends in industry is not yet understanding some of the people's.